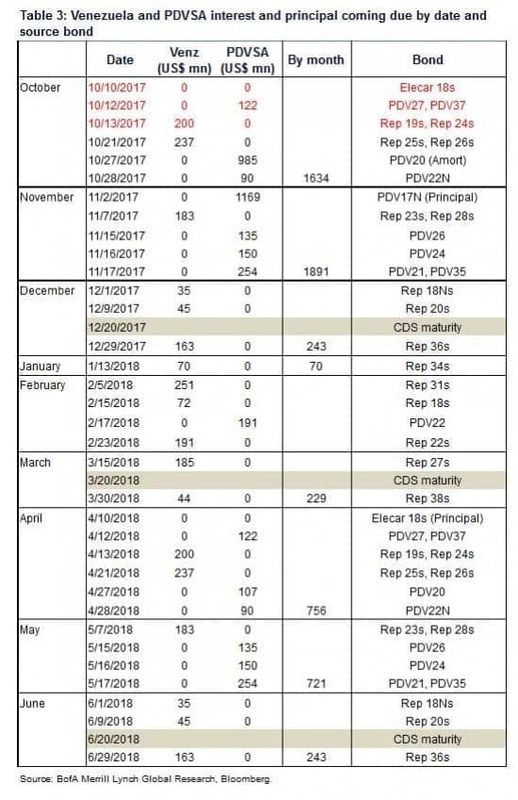 On Wednesday, when looking at the imminent principal payment on $842 million in debt issued by Venezuela's state-run oil company PDVSA , we warned that the state - which had previously activated a 30-day grace period on over $586 million in interest payment due over the past month - may be bankrupt shortly for one specific reason: unlike the rest of the country's debt, the PDVSA bonds have no grace period in the bond indenture for an event of default. It is also why some suggested that Venezuela was shoring up dollars by not repaying other debt, to have funds available for this particular issue. 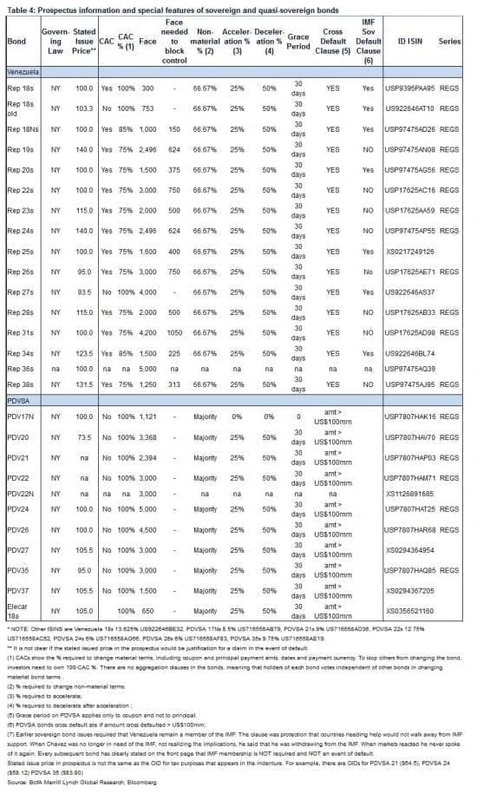 In retrospect, that appears to be the case because on Friday, PDVSA said that unlike the various other "technical glitches" that had accompanied Venezuela's previous interest payment, it has transferred funds to make a principal payment on debt due Friday amid jitters among investors that the energy producer could default as soon as today." According to Bloomberg, the Caracas-based firm said it paid $842 million on bonds that fully mature in 2020. The statement didn’t mention the $108 million interest payment that was also due Friday, but has a 30-day grace period. Petroleos de Venezuela SA owes an additional $1.2 billion by Nov. 2 for notes that mature that day. That said, we still have to get confirmation from the transfer agent that payment was indeed made, and didn't get lost in yet another "technical glitch." Well, that's one down... and many more to go. 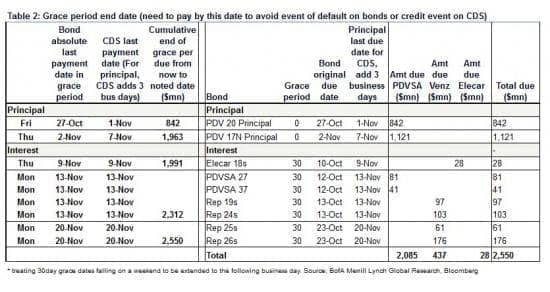 As the tables below show, Venezuela is entering a phase where it has a lot of interest payments and a lot of principal maturities. As such, it is not a question of if, but when the financially sanctioned state - which is finding that obtaining dollars is becoming more and more difficult - will default. It's like a private person paying off the interest of a credit card with another card. Only a matter of time. Their only hope is oil gets up to a reasonable bid and I doubt that'll happen fast enough. The scary thing is when you realize just how many countries have sanctions on them and how many more should have sanctions. Humans behaving badly.